Like the Ram, Aries has a reputation for egotism, action, self-assertion, and the desire to be first. Aries is a masculine sign that is looking for an identity. Aries can be fearless on the outside and timid on the inside. 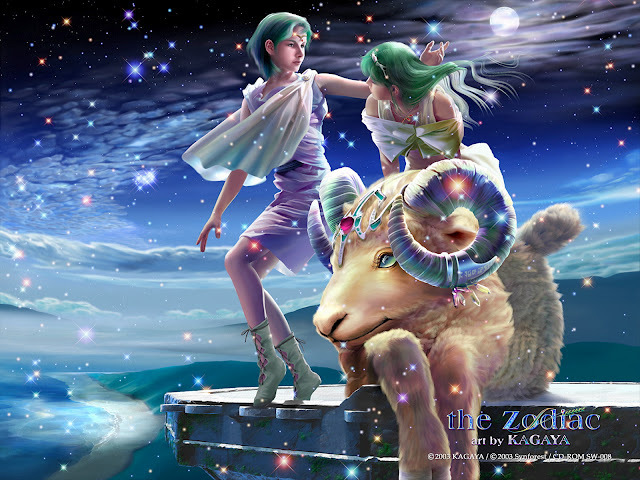 The ram spontaneously falls in love, but usually has a difficult time verbalizing his or her feelings. Headstrong and aggressive, the Aries has tremendous power and energy. Aries are leaders, entrepreneurs, and adventures, usually pushing the envelope in their direction. Moon in Aries: This is the best time to work magick involving leadership, authority, rebirth, spiritual conversation, or willpower. Healing rituals for ailments of the face, head, or brain are also done during this period of time.